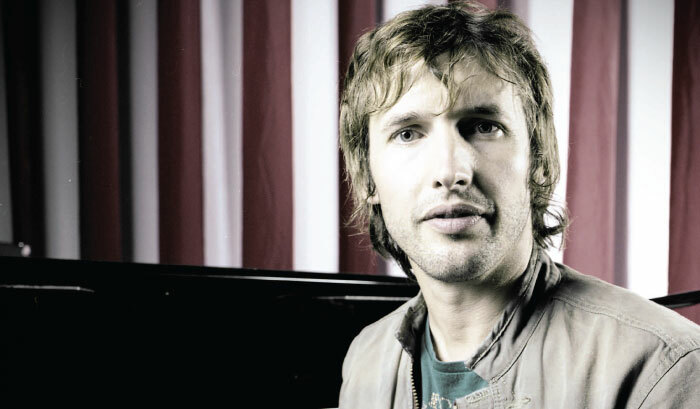 IN A WORLD DOMINATED BY industry-created pop idols, James Blunt was truly garnering plenty of attention for his unconventional path. He went from serving in the British Army to climbing to the top of the Billboard charts. When we caught up with him for the cover of our 13th issue, his single "You're Beautiful" had secured him a place in history as the first British artist to top the American singles chart in nearly a decade. After 10 months, his Back to Bedlam World Tour was nearing an end. All told, James performed more than 140 live shows in 2006, and on October 10, our crew flew to New York City to photograph him before his performance at Radio City Music Hall. But things don't always go as planned when orchestrating photo shoots with artists during the middle of the biggest tour of their life. Unfortunately, his team's production was running behind schedule, so we shot the whole shoot in 10 minutes, and it was all under the watchful eyes of a very disgruntled production crew. The photographer and crew literally ran on stage and ran back off, thankful that in the end, we we were able to capture a shot worthy of the cover.